The study, conducted by the University of Technology Sydney, estimated that 600,000 tonnes of plastic out of 900,000 tonnes was not recycled last year while the mid-2018 Senate inquiry recommended plastics like coffee cups, takeaway containers etc. be taken off the menu. The United Nations has estimated more than eight million tonnes of plastics are dumped into the world's oceans annually and the World Economic Forum has predicted in 30 years' time, our oceans will hold more plastic than fish if this continues unabated. But, engineers in the Davidson School of Chemical Engineering at Purdue University in the US are trying to turn back the tide by creating a new chemical conversion process that they said "could transform the world's polyolefin waste" into useful products such as pure polymers and napthas (mix of hydrocarbons), fuels or monomers (molecules able to bond in long chains). Professor Linda Wang, who is leading the research team developing this technology, also said it would boost profits in the recycling industry, offering attractive commercial potential. She explained that she became inspired to create the technology after reading that 8.3 billion tonnes of plastic had been produced over the last 65 years, with only 12% incinerated and 9% recycled. “Plastic waste disposal, whether recycled or thrown away, does not mean the end of the story,” Prof Wang said. Graduate student Wang Kai Jin and post-doctoral researcher Wan-Ting (Grace) Chen invented the technology, which can convert more than 90% of polyolefin waste. The team is working with A/Professor Gozdem Kilaz from the School of Engineering Technology and doctoral research assistant, Petr Vozka, in the school's Fuel Laboratory of Renewable Energy, to optimise the conversion process to produce high-quality gasoline or diesel fuels. The process incorporates selective extraction and hydrothermal liquefaction. Once the plastic is converted into naphtha, it can be used as a feedstock for other chemicals or further separated into specialty solvents or other products. Some of the results of Professor Wang's study were published recently in ACS Sustainable Chemistry and Engineering. A short video about the process is available to view. 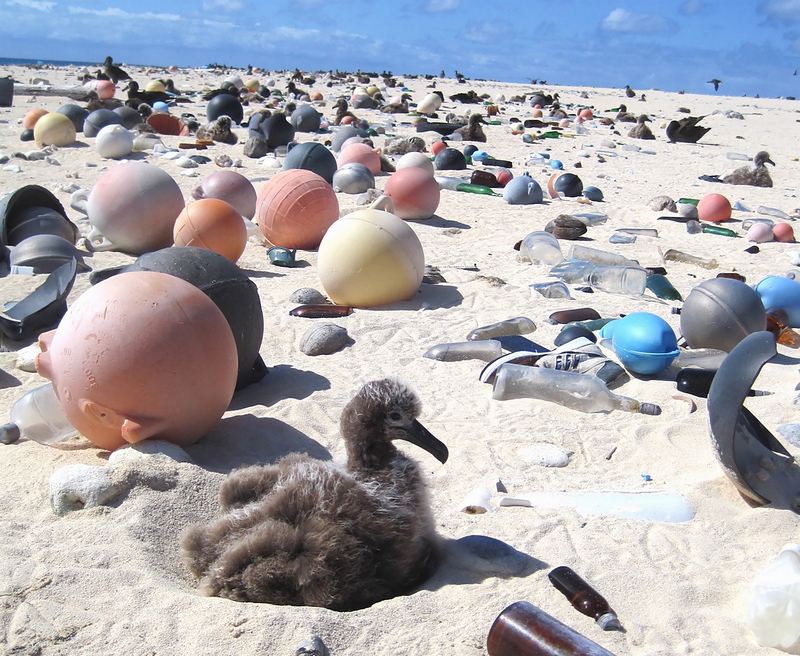 Image: An albatross chick sits amid plastic on the uninhabited (by humans) Midway Atoll Wildlife Refuge in the northern Pacific Ocean. Source: US National Oceanic and Atmospheric Administration.